From a small Vermont family farm dating back to the 1700s, Wood's Cider Mill's Boiled Cider magically captures the intense, robust flavor of just-picked apples. Fresh apple cider is reduced to 1/7th of its original volume, providing intensity and depth of flavor. Often called "apple molasses," this is a versatile syrup you'll enjoy experimenting with in the kitchen and at the bar! Willis Wood and his wife, Tina, own and operate Wood's Cider Mill in Weathersfield, Vermont, on land first settled by Willis' family in 1798. The couple remains loyal to the farm's apple cider history and hand-crafted, artisan products. Located on 175 acres in southeastern Vermont, Wood's Cider Mill has always been a "hill farm", with a mixed topography of rolling hills, woodlands and pasture. "By definition, hill farms don't have all their eggs in one basket. They have several businesses going on that keep income coming in throughout the year," explains Tina. Today, apple cider and specialty cider related items such as cider jelly and boiled cider remain the core of Wood's operation. They also produce maple syrup in the spring and raise about 50 ewes annually for the spring Easter lamb market. Cider jelly is an old-time pantry staple that not too many people make any more. 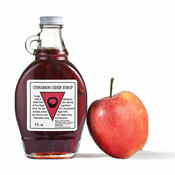 Over 100 years ago, many cider mills made cider jelly, a common food throughout the 1800's. The natural pectin elements in apples causes a natural jelling process when boiled. With the onslaught of commercialization and mass availability of jams and jellies 100 years ago, small-scale cider jelly making took a back-seat to the mass produced commercial products of the food industry. With today's strong, revitalized interest in local foods and the slow food movement, products like cider jelly are experiencing renewed interest. Cider jelly remains the biggest seller for Wood's Cider Mill, and the Wood's make between ten to thirty thousand pounds of jelly each year. They also make boiled cider, another product with historic roots. 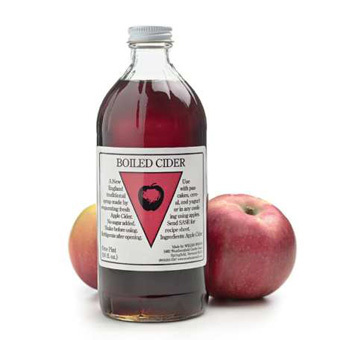 Boiled cider is an old-time ingredient and method of preserving the apple crop. It captures the flavor of the apples but is not too sweet. It was used by the Shakers in mincemeat, applesauce and pies. The Wood's use primarily Macintosh apple varietals in their cider, a total of 3,000 bushels per year. They grow some of the apples themselves, but most are bought from a neighboring orchard. They still use the farm's cider press from 1882, which makes about 200 gallons of cider per pressing.